As I research a lot on Internet, I often find a big number of tabs opened in my Chrome browser. Upon noticing the clutter, I would decide to close the unwanted tabs and start clicking the cross button —but with that quick succession of clicks, I sometimes manage to close even a tab that I actually needed! Uff! And then I would rummage through the browsing history to find the URL I so desperately needed. 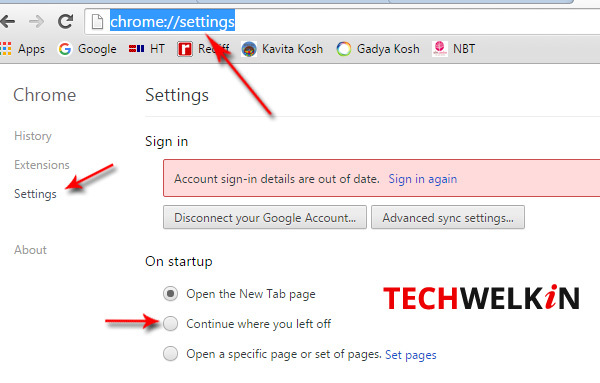 But now there are simpler ways to get your recently closed tab(s) back. Go to Chrome Settings menu > History and recent tabs > Select the tab you want to open. At present this option shows the last 8 tabs that were opened. You will not be able to open any older tabs with this option. This option works both in Windows and Mac iOS. Image showing history and recent tabs option in Google Chrome. I love this tiny but very useful option. Just press Ctrl + Shift + T keys together and the very last tab that you had closed will open again. This shortcut key combination is very handy is you realize your mistake right after closing the tab. This option will not be able to open any tabs older than the last closed tab. If you need to open even older tabs then you will have to sift through the browsing history. Please note that if you have been surfing the Internet using the Incognito Window, the browsing history will not be recorded. 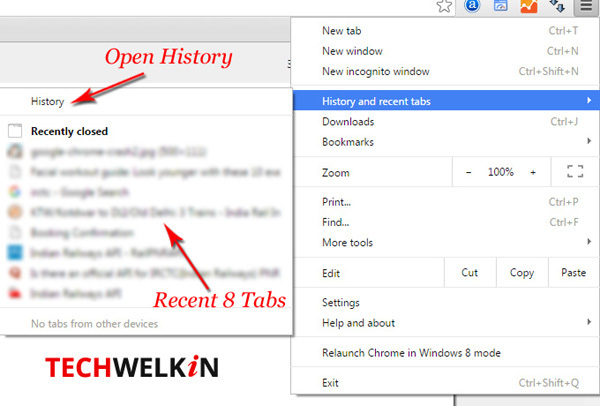 You can also open a new tab in Chrome and go to chrome://history URL to view your history. And the simplest method is to use the Ctrl + H shortcut. Browse through the history and select the tab that you want to open again. Google Chrome give you option of continuing a session where you left it off. Now whenever you will launch Google Chrome, it will automatically reopen all the tabs that were opened when you had closed Chrome last time. Chrome has Crashed, How to Reopen Tabs? Google Chrome didn’t shutdown correctly. To reopen the pages you had opened click Restore. Google Chrome offers to restore session in case of a crash. I hope this tiny tip would be useful for you and save you some precious time. If you have any questions on this topic, please feel free to ask me in comments section. I will try to assist you. Thank you for using TechWelkin. Had 6 sets of tabs open when shut down to “update” a program. 5 sets do NOT appear in history. Need them, what can I do. How do you open up the recently closed history in chrome? Go to Settings > History > Recently Closed. You can open the last closed tab by pressing Ctrl+Shift+T. Recently, the shift+crtl+t shortcut started opening the recently closed WINDOW, and not the recently closed tab. Any ideas or possible solutions. Hi Jonathan, we could not replicate this issue. When we do CTRL + SHIFT + T in Chrome, the last closed website opens up in a new tab.